If your answer to any of these questions is YES, then it would be to your advantage to read on. 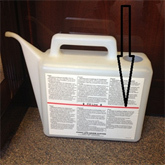 Fill the white filling container to the red line only. Pull the filler tube out from under the key bed. Insert the end of the tube onto the spout of the filling container. 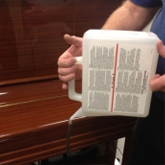 Lift the container and turn to allow the water to flow into the piano reservoir until the container is empty. Then drop the container to the floor to collect any fluid left in the tube. 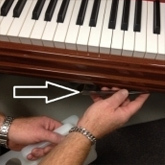 Disconnect the fill container from the tube and tuck the tube back under the keybed of the piano. Red light flashing on the Damppchasser Piano Life Saver System. If the red light is flashing this means your pads are dry and the humidify side of the system will not work. There are 2 causes of this problem. The pads are dry because the water has run out in the reservoir. The yellow light is flashing as well and you need to put more water in the reservoir. (allow 15 minutes for the pads to soak up the water) The red light will go off then. this often occurs when you come back from a Holiday. The pads have not been changed. 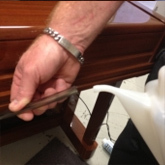 When you have your piano tuned, ask Gary or your tuner to bring new pads for your Piano Life Saver System. 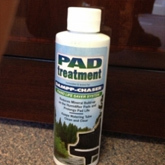 I recommend changing your pads twice a year in dry situations or using tap water and once a year if you use rain water or distilled water. Otherwise they will need to be changed twice a year. I am finding that Perth water is quite corrosive. It is better than no water. 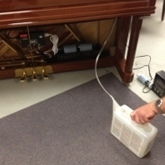 Their is no fire risk if your Piano Life Saver System runs out of water. It automaticly turns off that side of the system. This will depend on the humidity of your room at the time. If it is at 40% to 60% you might not hear any change, however a prolonged period with the system off at 0% to 40% and or 60% to 100% will cause the piano to go badly out of tune. Note: If your Piano Life Saver System has been turned off and your piano is booked for tuning. Allow 3 weeks for the piano to settle again before tuning. So you may need to re-book your tuning.. We recommend not turning off the system at all. Use a lightening protection adapter for your system.